Locker rooms have seen a lot of changes over the years. No longer is the sweaty-smelling, messy area acceptable. 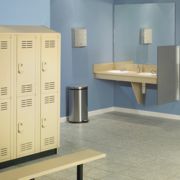 Today's locker rooms focus on comfort and meeting society's ever-evolving needs. After careful consideration, we've selected the winners of our seventh annual design awards competition. We're proud to showcase those facilities here, from renovated aquatic centers to natural play areas, college and community recreation centers and more. Read on to see how these cutting-edge projects raise the bar for recreation, sports and fitness facility design across America. When deciding which company is best suited for a field project, many face the choice of working through a general contractor who hires subcontractors, or working directly with a field builder who handles the entire job. Facing not-uncommon budget constraints, public park and recreation leaders might wish to consider a phased approach to creating an aquatics facility that offers some amenities sooner, with more offerings to come online later, as resources permit. Proposed rule changes in the ADA law will impact who can swim—and where. Learn more to understand how your facility will be effected—and how ensuring accessibility is always a smart move.